Well hello there! How do you like my dress? It was given to me by the same friend who gave me this one: does this friend have great taste or what? Like the other one, it will have to undergo a bit of surgery before I can wear it in the open world… I hope I can finish it on time to enter it in the refashion contest organised by French sewing community Thread&Needles! Fall has definitely arrived here in Belgium! 🙂 I could do without the rain of course, but other than that I’m really happy about it: fall is such an inspiring season, knitting and sewing wise (and I’m not even talking about cooking and baking, yum!). As far as knitting goes, I’m still begrudgingly working on the same old project (yawn), so I had to turn to sewing to truly welcome my favourite season. 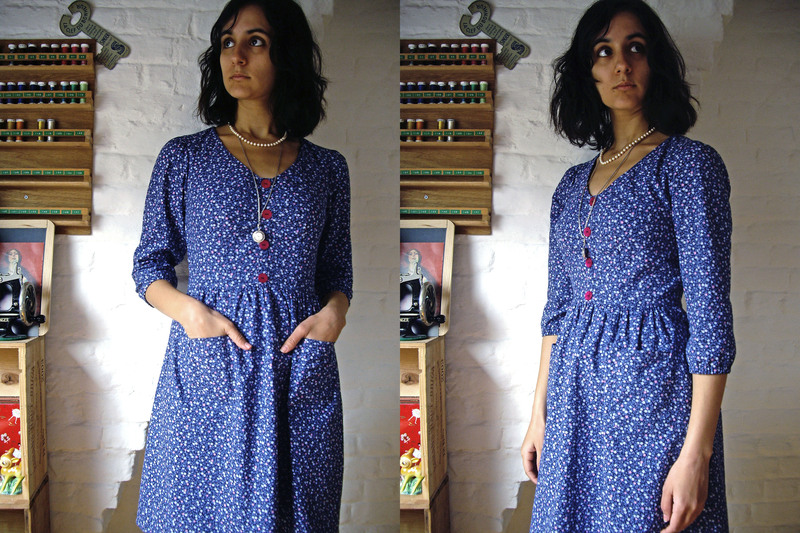 To me, the Sureau pattern by Deer&Doe is the fall dress par excellence. I don’t really know why, actually: is it the length of the sleeves, the fact that it looks great with tights, that it can be layered effortlessly, that it screams for a floral pattern? 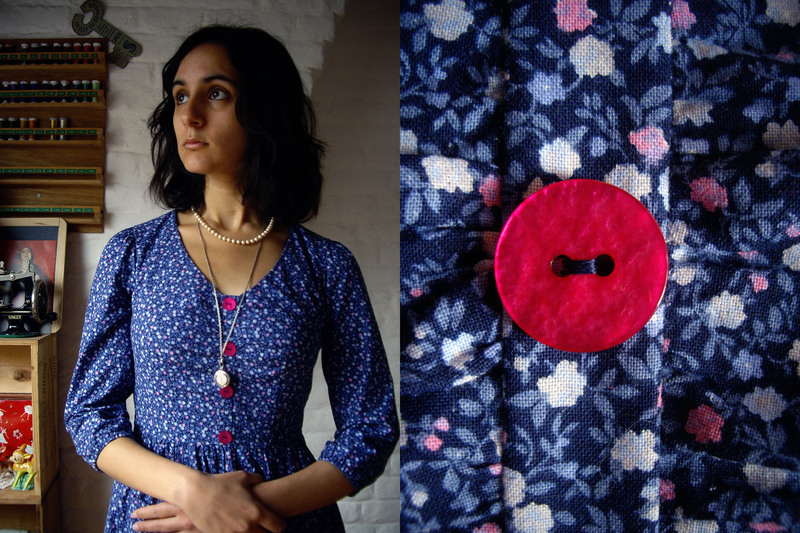 Whichever it is, I couldn’t wait any longer to sew a Sureau, especially since I recently found the perfect fabric (at Berger in Brussels), a cotton lawn with tiny blue, white and pink flowers. 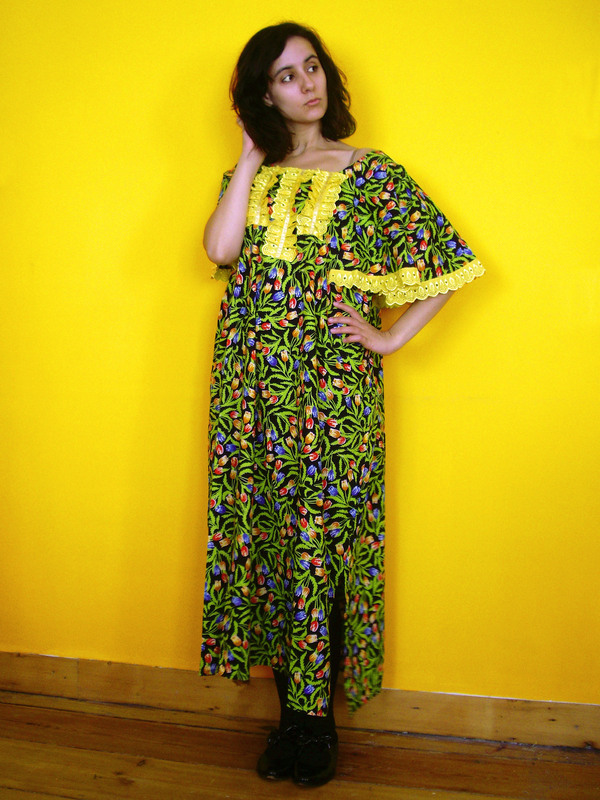 The fabric was a dream to work with, as was the pattern. My only tiny complaint about the pattern is that I couldn’t find any mention of the buttons in the explanations (I was wondering whether the button markings on the pattern corresponded to all the sizes or to one size in particular). Though I have to say, I didn’t have any trouble figuring out that part. 🙂 I just found it weird, that’s all, especially on a beginner pattern. Maybe it was an oversight in the first print of the pattern and it has been corrected since? Anyway, I’m nit-picking, other than that the instructions were perfectly clear and easy to follow. Seeing as the first two Deer&Doe patterns I sewed fit me quite well, I didn’t bother making a muslin for this one. I didn’t make a single fitting alteration and the fit is close to perfect, if I do say so myself. I cut a straight size 36 even though I’m a 40/42 on the bottom, thinking the gathered skirt would be forgiving, which it was. The only modifications I made were style choices, the first one being that I need my dresses to have pockets (I’m not carrying my tissues in my bra anymore! ), so I added two patch pockets. The second one concerns the sleeves: I’m not totally sold on the form of the original sleeves, which are a little too billowy to my taste, so I added an elastic in a casing at the hem. It gives the sleeves a puffier look, which I love. Also, although I don’t know whether to call that a modification, I understitched the collar facing instead of topstitching it. Oh yes, and I lengthened the skirt a little by making a baby hem instead of the recommended 2cm hem. Now I have to decide on my next sewing project: another dress, leggings for lounging at home, a desperately needed coat…? Like a lot of my projects it seems, this one almost ended up in the trash. I had this idea in my mind that it would be a quick and easy project, and where could I go wrong fitting wise on such a simple skirt? Well, for starters, I forgot to take ease into account when picking the size of my waistband, so I cut one a little smaller than the XS, which turned out to be a little on the tight side. Nothing horrible, but I doubt I could eat a big meal without it becoming uncomfortable. When I first tried the skirt on, I also noticed the weird horizontal pucker you can see in the picture above on each side of the top of the hips, as if there was not enough room for my hips. But what is even weirder is that these two puckers also appear when the skirt is on my dressform whose hips are, to say the least, less well-endowed than mine. So I don’t really get where those come from. Any ideas? 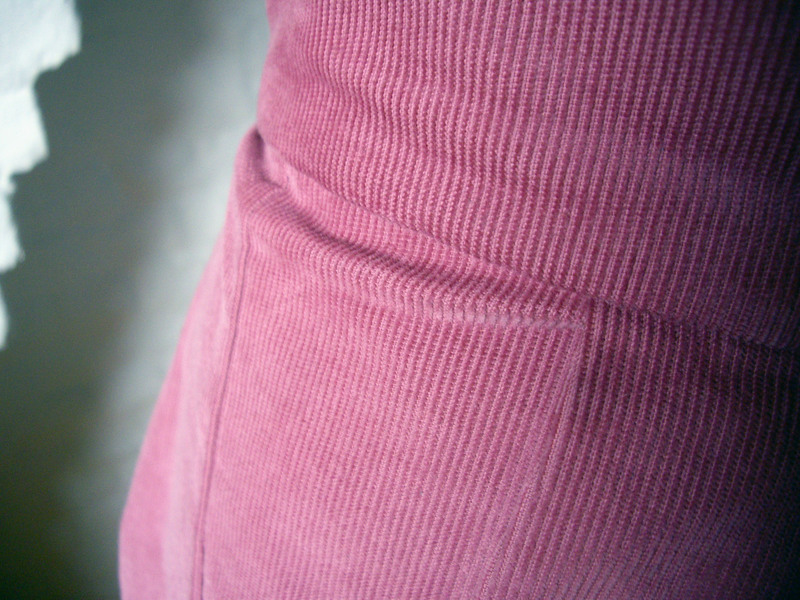 I also realised I had sewed the waistband so that the nap of the corduroy doesn’t go in the same direction as on the skirt itself, but I must say I don’t even see the difference (I can only feel it with my fingers) with such a short pile. 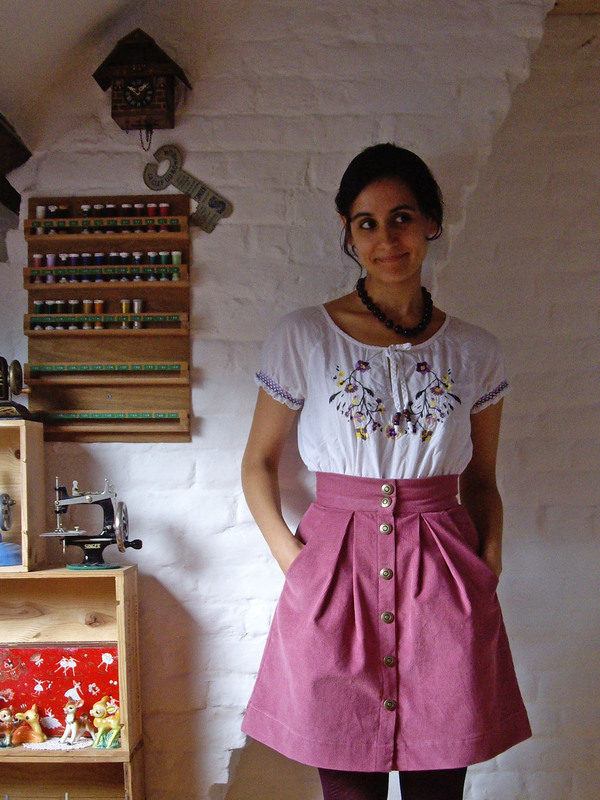 So I’m not really in love with the finished skirt, but there are things I like, such as the fabric and buttons, for example. The fabric is a thin whale cotton corduroy, which was a dream to work with, and I LOVE the antique pink colour. What’s nice is I used much less fabric than what the pattern recommended, so I still have about a meter left if I ever feel like making another skirt in the same fabric. The buttons are some “Anorak” press fasteners from Prym, which were very fun to put in with a hammer (my boyfriend who was trying to work downstairs does NOT agree) and look nice and sturdy. 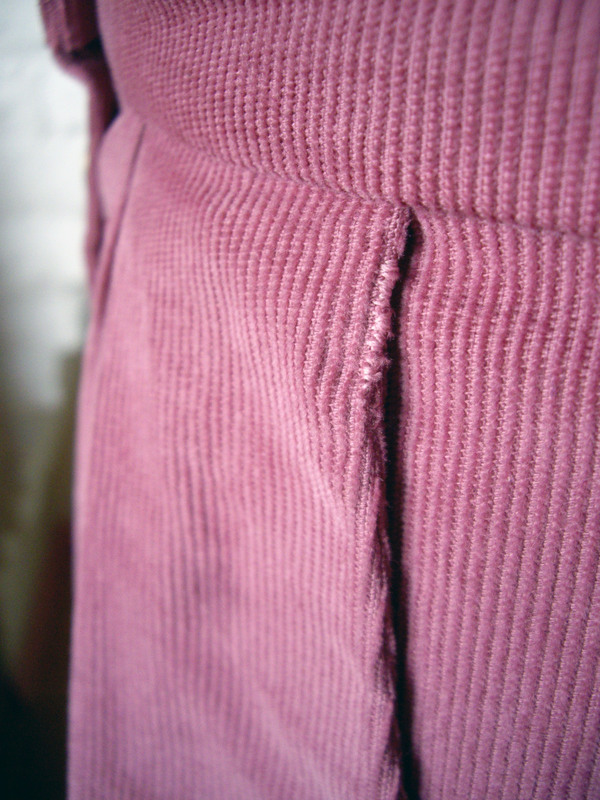 Also, I put a lot of effort in the finishing techniques: I tried not to use unnecessary topstitching because I don’t think it would have looked nice on my fabric (other than that I usually love topstitching), so I understitched the pockets and invisibly hand stitched the inside of the waistband. And where I had to use topstitching, I don’t think I’ve ever sewn a line that straight. So not everything is negative about that skirt. Even though it’s far from perfect, it would have been a mistake to throw in the towel too soon. It clearly won’t be my favourite skirt, but I still can see myself wearing it a lot, and it would have been a shame for it to end up in the trash. I really have to learn not to make a mountain out of a molehill when something doesn’t go according to plan on a project (which, let’s face it, is every single time).